It is recommended to buy tickets in advance and to reserve seats 24 hours before departure if your group wants to sit together. (Not all of the employees speak English, which was no problem for our group of “gringos” because we all have some basic Spanish, and one of our party was fluent in the language.) None of the other passengers were Americans, all were pleasant to us, and the skillful drivers were professional and courteous. 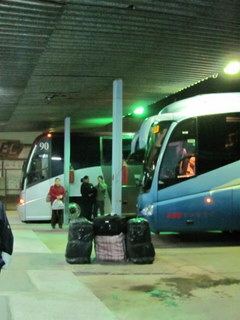 We didn’t change buses until we were all the way down to Navajoa, a city near the southern tip of the state of Sonora. 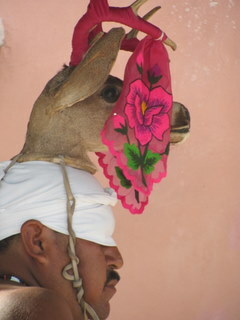 Then we took a one-hour bus to Alamos. Although the bus trip was far easier than I expected, it was still a 13 hour bus trip, and it was lovely to get to our artistically decorated room in an annex of the hotel “Hacienda de los Santos” The hotel is a former hacienda which is owned by Americans who have decorated it with lovely colors of paint, paintings and hand-woven rugs, and beautifully landscaped the grounds with lush plantings, statues, and fountains. The annex, called “Posada Tacobayu” is more reasonably priced than the main part of the hotel, but we had access to the same breakfast room, internet, etc. It’s true that our shower was somewhat low on water pressure and the water barely warm. As in many older hotels throughout the world, we were only given one key for the room, although there were three of us. These things were unimportant compared to the lovely setting and service. Soon we were having a pleasant breakfast at “Koky’s” a little restaurant with a beautiful patio-garden. One of our party had visited Alamos several times, and other restaurants she recommends are Las Palmeras, the Café del Sol, and Reyna’s. 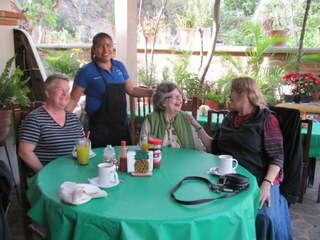 In many restaurants in Alamos, the coffee one gets is instant coffee! But I got a wonderful cappuchino at Café del Sol and there is also a cafe on the high portal with a great view of the church plaza, which sells espresso drinks, luscious slices of cake, and other goodies. 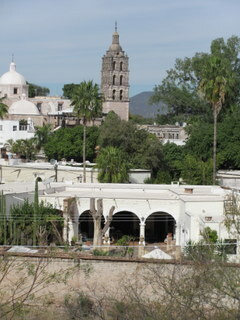 Alamos is a very old town which became rich through its mines, which yielded silver, copper, and gold. Many of the buildings date from the 16th century. When the rich ores were depleted, the “ricos” departed, and many of these buildings had fallen into ruin. 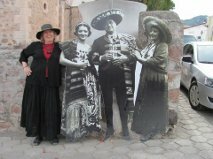 American expats, many artists among them, began to move to Alamos and restore the historic buildings, and now these expats number around ten percent of the population and have become very involved with the goings on of the town. Alamos is the sister city of Scottsdale, Arizona, and the mayor of Scottsdale and many of the Scottsdale members of the sister cities’ organization were there for the festival, and stayed at the same hotel. The group sponsors a student exchange program with Alamos, and other charitable projects, besides helping relations between our two cultures. The town has two main centers… the main plaza, with its wrought iron bandstand set in a lovely square planted with flowers under towering, slender palm trees, adjoins the massive, stone 16th century church. Around the plaza are the famous “portales” the covered sidewalks lined with arches, cool to walk along even in the heat of the day. I recommend the Museo de Costumbristas, (excellent displays on the local history). You will also find the Palacio Municipal (the city hall, where the opening night gala performances are held) and many restaurants and cafes. Go through a little alley called the “kissing alley” you find the other center of action in the town, a long double avenue with a tree lined park in between, called “the Alameda”. Here is found the day-to-day action of the town, the bus-station, our favorite taco stand, the Mercado building where everyone buys their groceries, and lots of shops. 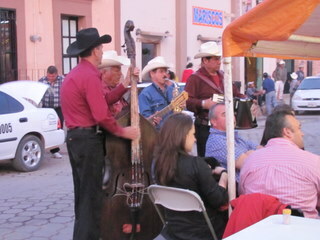 Friday during the day we went to see some Yaqui dancers and musicians perform in front of the Artesania Mercado (folk crafts market) a little ways outside of the town center. 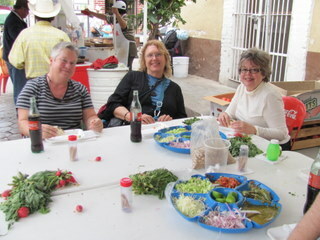 There were some tables set up under a shade cover, and Yaqui women were stretching out huge tortillas by hand. Two huge aluminum pots on an open fire held red chile and green chile. So of course we had lunch as we watched the performance, and then did some shopping. As the day went on, one could sense the excitement building, as more and more people began to arrive. Groups of police in brand new dark blue uniforms were manning every corner; a the governor of Sonora would be attending the opening night ceremony. Stages were being set up in the Callehon (a wide alley by the church) in the long park at the Alameda, and at a villa a ways out of town, for the rock band concert. There was a huge line of dressed-up people for the opening night concert, so we were glad that we had asked the hotel to arrange for tickets for us. I had never heard live opera singers before, and I was just blown away by the skill and emotion displayed by the two Mexican singers who performed. It was fun to see all the VIP´s hob-nobbing during the intermission, in the colonial-era palacio which serves as city all when its not festival time. 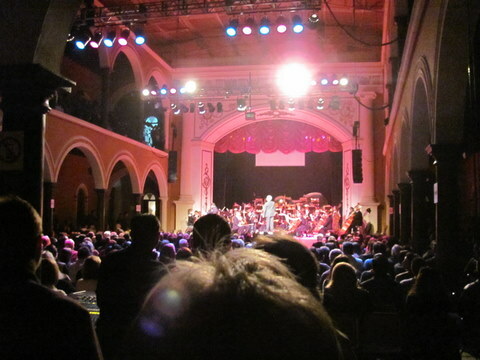 It has two stories of loggias built around a plaza, and the concert was on the stage at the front of this. 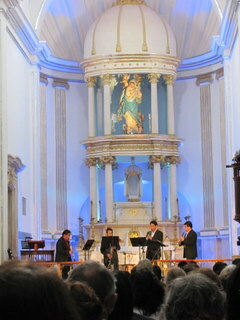 Other performances included “zarzuela” musical light opera performed by a university troupe, a German country-western band, a Mexican country-western band, a classical clarinet quartet in the lovely church, a group which played Afro-Latin music, and others. 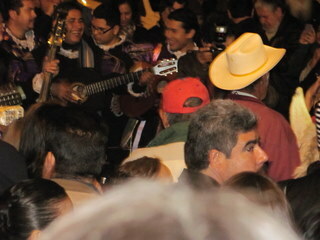 Student troubadour groups called “estudiantinas” led the crowds through the streets when the opera performance let out, and street performers along the Alameda included roaming groups of “banda” music, lovely vaquero music, clowns, and even a world music drum and dance group. On Saturday morning, there is a home tour which includes several of the most magnificent restored colonial homes. It meets in the street in front of the Museo de Costumbristas, is run by a group of ex-pats who donate the proceeds toward scholarships for the youth of Alamos. I so enjoyed seeing how beautifully these homes and gardens have been restored. 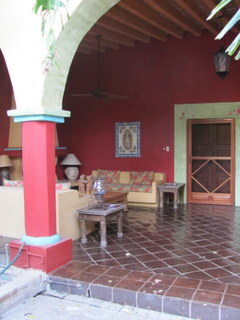 One of the owners collects Mexican colonial art, and had decorated her entire home in that style. 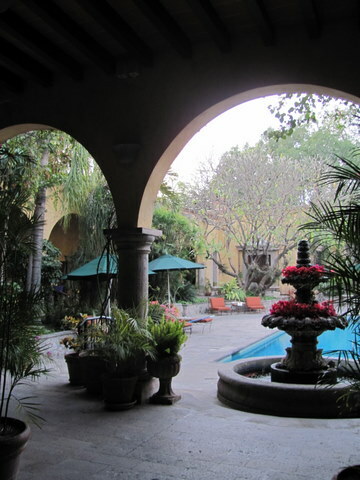 I chatted with the American owner of the Hotel Hacienda de los Santos over breakfast one morning, and he told me that he and his wife looked all over Mexico before they decided to settle in Alamos. The reason for their decision is that the expat community in Alamos is more thoughtful and more involved in the local community than in many expat communities. Three of the American families have teenage children, and they go to local schools. I am so pleased that I have had the opportunity to visit this gem of a city, and to attend the first weekend of its wonderful music festival. I can see why a Mexican movie and a “telenovela” have been filmed here. All of the rich sights and sounds and memories will stay with me for a long time. This entry was posted in Mexico, Travel Stories on June 10, 2014 by Laviajera1.